"THE MASTER POTTER", A Christian Contemplation"
Though the Lord spoke to Israel through Jeremiah, God continues to speak to us today. Have you ever "thrown" clay or watched a potter at his wheel making a pot? 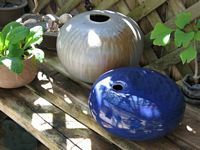 From my own personal experience, I discovered my weakness in centering a clump of wet clay with my hands on a spinning potter's wheel, at the same time my feet moving to control the speed of the wheel. My hands needed to be strong enough to hold the clay in place, lest it go off balance and ruin the roundness of the pot in motion. I not only needed strength but steadiness to keep the clay from running off the wheel! I was blessed to be able to watch the late Sasha Makovkin's skill on a potter's wheel. Ordained in the Presbyterian Church as Evangelist, he presented years of experience as a potter in forming a pot while speaking the word of God at the same time! His words with actions made Scripture come alive! Sasha and his wife's property in Mendocino, California is situated on hardpan soil. This stunts the growth of trees and shrubs into a natural "pygmy forest." The ash of burnt prunings are mixed in with other chemicals on the pottery to create distinctive colorings when fired in the kiln, making each vessel a unique creation. "But indeed, O man, who are you to reply against God? Will the thing formed say to him who formed it, 'Why have you made me like this?'" (Romans 9:20) Will we ever learn, O man, O woman, to allow the Master Potter, the Creator of the entire universe to have His own say in creating? We, as God's creatures, are not made with a beginner's hands. Just as a master potter on earth skillfully gives form to a lump of clay for a specific purpose, so God, the Master Potter creates unerringly each creature according to His specifications, in His image, perfect in His plan for each unique individual.